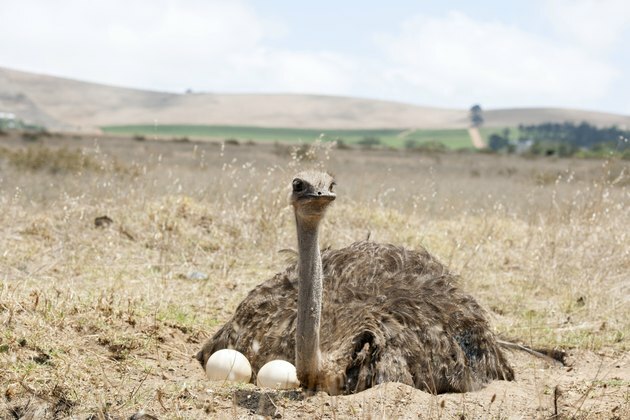 Ostrich eggs are the largest laid by any bird. They measure approximately 6 to 7 inches in length and as much as 18 inches around. Ostrich were first imported to the United States in the 1880s. The breeding industry surged in the 1980s, and as of 2002, there were 1,600 ostrich ranches in the United States providing meat, feathers, hides and eggs to consumers. No one individual is ever likely to eat an entire egg in one sitting, as one ostrich egg is roughly the equivalent of 24 chicken eggs, according to the Wellsphere website. A serving of ostrich egg equal to one chicken egg contains 83 calories, six more than an average-sized chicken egg. An entire ostrich egg contains approximately 2,000 calories, notes Wellsphere. Both types of eggs are approximately 47 percent protein and 45 percent fat. According to the Mazuri website, an ostrich egg contains 16.29 IU/g vitamin A, while a chicken egg contains 20.5 IU/g. There is an even greater difference in vitamin E content: 39.95 IU/g in a chicken egg but only 15.31 IU/g in an ostrich egg. However, ostrich eggs are a good source of thiamine. Ostrich eggs are somewhat richer in magnesium and iron than chicken eggs, but offer less manganese and zinc. In fact, the manganese content is approximately half that found in its chicken counterpart. Ostrich eggs also contain calcium and phosphorus. A study reported on by Mazuri found a high level of selenium in some ostrich eggs due to feed supplements the ostriches were receiving, indicating a possible toxicity problem with eggs from ostriches who are fed this way. Ostrich eggs are much lower in cholesterol than chicken eggs, and a little lower in saturated fat, making them a healthier choice. Unfortunately, serving one is problematic unless you are feeding a very large family or group of people.